sh ow the measured roughness depth (Rz) as well as the average roughness value (Ra) in µm. Roughness testers allow a user to determine the material surface roughness quickly. The measurement of surface roughness is very easy. Roughness testers get in contact with surfaces within a few seconds and show the roughness value in Ra or in Rz. Our Roughness testers will be delivered with control cards, probe protection, accumulators and chargers inside a carrying case. Roughness testers are compatible with the following standards and regulations: DIN 4762, DIN 4768, DIN 4771, DIN 4775, and DIN 4766-1 dealing with the range of surface roughness. Some of these products have an internal storage facility which helps you to save your measuring results and check and analyze them again afterwards. There are many parameters that can be measured with these instruments. No matter is you are a professional who has to work with these or just a beginner who wants to learn something about roughness - these instruments are suitable for everyone who wants to learn something about roughness. If you do not find the roughness testers you are currently looking for, please, contact us and we will help you find the best solution to suit your needs by calling our offices on: UK customers +44(0) 23 809 870 30 / US customers (561) 320-9162 and our technical staff will advise you regarding our measuring instruments, our scales and our products from the field control and regulation. Rz: The average of the roughness depth in µm (the arithmetic average of five consecutive depths in the measurement length). 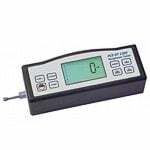 Roughness testers are used to detect the material surface roughness depth . Roughness testers indicate the roughness depth in µm (Rz) and the roughness average value (Ra). We have a maximum of 13 measuring parameters available. Standards regarding the working elements roughness surfaces: DIN 4762, DIN 4768, DIN 4771, DIN 4775. roughness surfaces view. Roughness testers will be delivered calibrated (without certificate). Optionally, you can order a laboratory calibration with an ISO certificate for roughness testers, in order to integrate these testers inside your set of quality tools or for an annual recalibration (with PCE or any other authorised laboratory). For many companies and also for private persons it is essential that the gadgets they order have a high level of accuracy. In fact all products by PCE have this high accuracy but in addition to that we send our products to an independent calibration laboratory (if ordered) to ensure that you will get the best products with lowest deviances. Some of our products are certified in that way that they can be used at the court when an adjuster has to make tests. If you wish to view or print a selection of Roughness testers from our catalogue, please click the PDF symbol.